Last night, I roasted some turkey thighs and wings along with some aromatics (onion, carrot, celery, and garlic). The next step was to make stock from the roasted turkey and vegetables. I was tempted to make the turkey stock last night, but I didn’t have the energy and I had a banging headache starting up. This morning, I woke up with that same headache. After a trip to the gym and a bowl of cereal, I swallowed some ibuprofen and started cooking. I started with turkey stock. 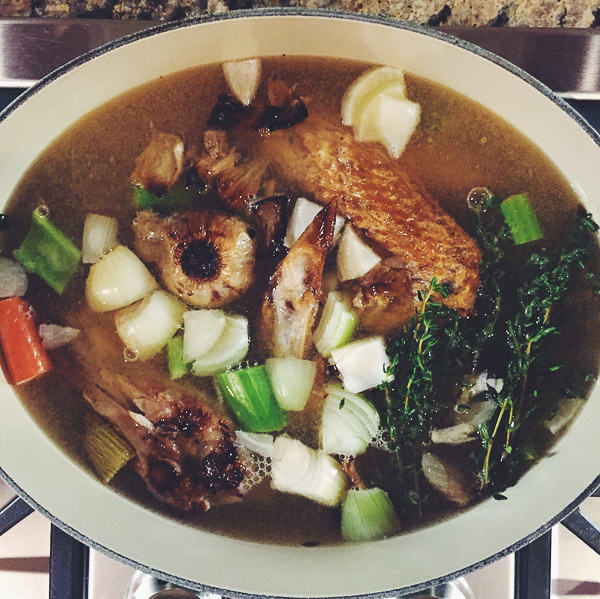 Those roasted turkey parts simmered gently in a pot of more aromatics, some thyme, chicken broth, and white wine. Slow bubbles rose to the surface before breaking and releasing the most heavenly aromas. As the house filled with scents of Thanksgiving over the next two hours, my headache slowly disappeared.